We offer transparent plastic boxes that are available in various colors and shapes and are spacious enough to store different amount of food. 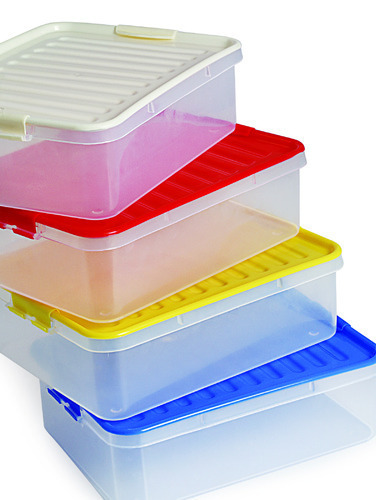 These are easy to carry boxes and are offered with leak proof lids that fix tightly on the box and are available in different storing capacities. Our expertly crafted products are extensively appreciated the world over and we have an extended client base across many industries and corporations. We are well known manufacturer, exporter and supplier of airtight containers, casseroles, flasks, plastic packaging boxes, soap dishes, water carriers etc. Our wide variety of thermoware and household products find multifarious uses and are supplied to clients in all corners of the world. We have also paid adequate attention to environmental concerns and ensured that waste disposal from our manufacturing facility is done in an environment friendly manner. With our product's quality, reliability, consistency, hygiene and flexibility we constantly endeavour to provide exceptional service to our clients.